A children’s book author has come under attack for doing the unthinkable… He’s Jewish and he’s written a Christmas story in which Santa Claus isn’t just gay, but he’s also… black! 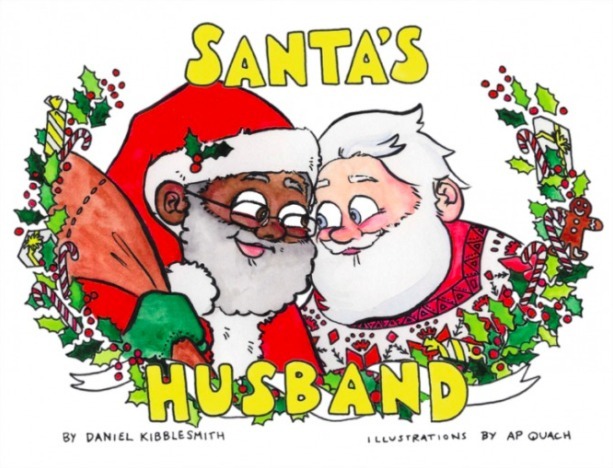 Daniel Kibblesmith is the author of Santa’s Husband, published by Harper Collins this week. It tells the story of Kris Kringle, a black Santa who lives happily with his white husband in the North Pole. The book is illustrated by A.P. Quach. “We see it as an all ages book; in stores it will be in the humor section. But our goal was to write something that any kind of family could theoretically enjoy at Christmas time, on any level,” Kibblesmith tells VICE in a new interview. Kibblesmith and Quach have faced a lot of online backlash and trolling over the book. He recently discovered his picture on a white supremacist’s blog trying to “out” him as Jewish. He and his family have also received a barrage of nasty emails and hateful comments, mostly anonymous, though he says that was to be expected. “The scary stuff for me has been a lot of anti-Semitism,” he remarks. Jesus (Yehoshua, Yeshua, etc.) was many things but “white” he wasn’t; more likely, he was like the Middle Easterners of today, and Santa Claus is a fiction, but the original Saint Nicholas was a Greek born in Asian Minor (now Turkey), so again, an Aryan from Northern Europe he wasn’t. The comic book is cute, but why are people so threatened? If you can’t deal with the innovations on Santa Claus (Black, gay, with a husband, etc. ), don’t read it! We actually have no idea what the people who lived in Judea and Samaria 2000 years ago actually looked like. It’s because Santa (even though fictional) is a straight, white male character and always has been. Have no problem with a gay santa but he is always been a fair complexioned guy . I always knew Santa was a closeted bear. If you can move the original Saint Nicholas to the North Pole, give him flying reindeer and a sleigh large enough to contain the billions of gifts that he is going to distribute around the world in a single evening, how is making him black less believable? I’m neither black nor a Christian, so I have no dog in this fight, but why does it matter to anyone since it’s all magical thinking? You’re not changing history, your changing a fairy tale. Santa Claus is dead. They just found his grave in Turkey. And he was dark skinned.